Mali is entering three days of national mourning following the terrorist attack that killed at least 19 people Friday at a hotel in the capital, Bamako. The attack marks a spreading wave of violence in the West African nation. A few days after the terrorists struck, the Radisson Blu hotel in Mali's capital city, Bamako, bears the scars of the November 20 attack that left at least 19 people dead. American embassy contractor Terry Kemp recalls how he hid under a table when the shooting started. "Three terrorists came in, started shooting, they were standing right next to me,” he said. “I knew it was over. I knew they were going lift up the curtain and that was it." But they did not, and Kemp survived. The casualties Chinese business executives, Russian airline employees and citizens of several other countries. The hotel, one of the most luxurious in the city, was a favorite for international businessmen and diplomats. Several days after the attacks, questions remain. The author of the attack is still unknown. Two armed groups have claimed responsibility. University of Bamako professor Issa N'Diaye says it is a game of power between armed groups. "Each group claims to be behind the attack, so the authorities will acknowledge them and their capacity to cause harm and include them in whatever negotiations there are," he said. Mali has seen a growing number of armed groups during the past few years. In 2012, the north of the country was occupied by jihadist groups linked to Al-Qaida. A french military operation dislodged them, but violence has remained. At least five armed groups with links to Al-Qaida or to the Islamic State are now responsible for various act of violence across the West African country. People run to flee from the Radisson Blu Hotel in Bamako, Mali, Nov. 20, 2015. The attack in Bamako, the second this year, confirms a spreading of the violence that was once confined to Mali's northern half. 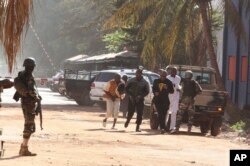 Visiting the hotel after the attack, Mali's President Ibrahim Boubacar Keita called for a global mobilization. "The challenge we are facing now is a global challenge," he said. "What happened here has happened before in Paris, and to Moscow... So we have to strengthen and join our effort so to face the challenge." More than 3,000 French troops have been deployed since last year in Mali and neighboring countries to tackle terrorists groups in the Sahel region. The United Nation peacekeeping mission in Mali, the third biggest in the world with close to 13,000 members, is also one of the most dangerous in U.N. history, with more than 50 blue helmets killed.